Keith Curle said there were ‘a lot of very pleasing aspects’ to come out of his side’s performance at Grimsby Town on Saturday, despite also admitting the Cobblers lacked quality in the final third. 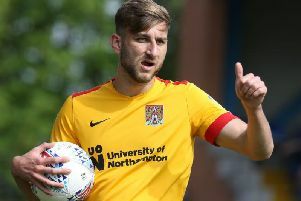 Whilst ending their four-match winning run, the 0-0 draw at Blundell Park made it eight successive games unbeaten for Northampton as they continue to push for a top-half finish in League Two this season. Could I have done it earlier? We had a good foothold in the game and things were going OK and we just needed that break, but I’m pleased overall and I’m pleased to have those options available. The visitors were the better team, particularly in the second-half, but they failed to really test home goalkeeper James McKeown, managing just a solitary shot on target across the 90 minutes. “We weren’t quite able to put quality balls into the box that have given us pleasing results in the past few weeks but I walked into the changing room afterwards and you can tell there’s an air of disappointment from the players because we haven’t won. Knowing his side need victories to chase down the play-offs, Curle took the attacking option on Saturday when sending on striker Marvin Sordell for midfielder Daniel Powell and going two up front for the final 25 minutes. He added: “We wanted to go 4-4-2 to get an extra man in front but both Andy Williams and Marvin Sordell knew that, out of possession, they had to sit in. “We went through a two or three minute spell when (Jake) Hessenthaler was sitting out and being their spare man so we allowed them to do that but then we had the advantage of another man up front.